Roseann Greco takes a parting shot at fellow South Burlington city councilors. Rosanne Greco, a retired Air Force colonel who has fought to prevent local basing of the F-35 jet, capped three turbulent years on the South Burlington city council with a verbal thrashing of most of her colleagues on Tuesday night. Greco, who is not seeking re-election, accused three councilors of orchestrating “a mockery of democracy.” Chairwoman Pam Mackenzie and council members Pat Nowak and Chris Shaw constituted a “bloc of three” that ignored the views of many South Burlington residents and appointed political supporters to city positions, Greco charged. “I am very concerned that this city will go back to the old way of doing business in which residents' wants were overshadowed by what big developers wanted to do in our city,” the former council chairwoman added in a prepared statement. Greco's barbed farewell remarks demonstrated the passion and polarization that have come to characterize politics in South Burlington. The bitter battle over the F-35 was representative of a wider fissure in a changing community where aggressive liberals have challenged the suburban-style conservatism that has long prevailed. The three councilors, who supported bringing the F-35 to the Burlington airport, wore stony expressions throughout Greco's 10-minute tongue-lashing at the start of the meeting held at the South Burlington police station. Each of the three then spoke graciously about the woman who had just said she was “profoundly disappointed” in their behavior. Shaw thanked Greco for her service, while noting his disagreement with her stands against the F-35 and in support of an interim zoning initiative that has limited development in South Burlington. “She certainly lacerated me when we were not on the same page with those things,” Shaw said. 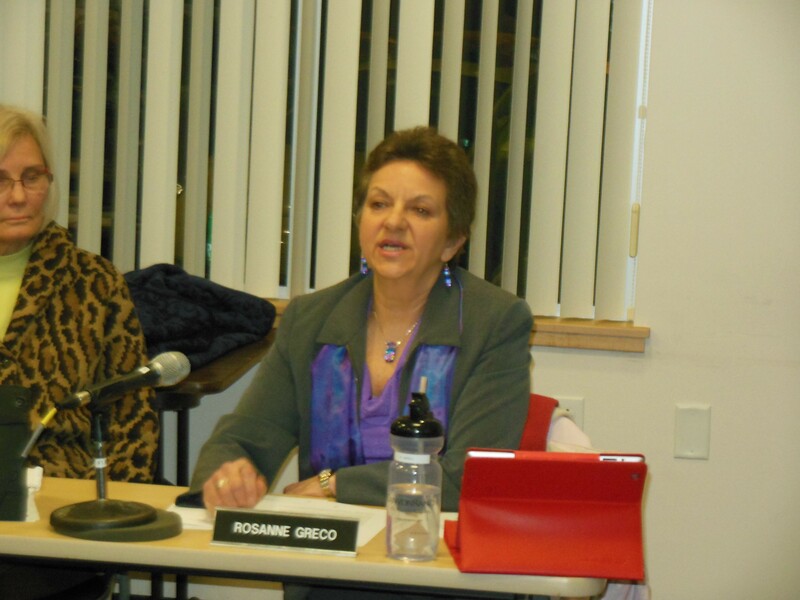 Greco's complaints were based on specific instances she cited in which “the bloc of three” had allegedly failed to listen to residents' opinions. Some residents react with supportive applause, other with silence, as Roseann Greco blasts fellow councilors. She recalled that after Nowak's and Shaw's election victories last year, a council majority “immediately agreed” to a request by one of their supporters to reconsider the body's stated opposition to the F-35. But a few weeks later, Greco added, the three councilors rejected requests that the scheduled session on the F-35 be postponed for two days to allow a panel of experts to present information on the effects of aircraft noise on children. Mackenzie, upon taking over as council chair last year, immediately “usurped her authority,” Greco added, by replacing the heads of interim-zoning committees with her political allies. Left and right will again collide at the polls in South Burlington on March 4. Tracey Harrington is running, with Greco's support, against Mackenzie for a three-year council seat that is also being sought by former councilor Paul Engels, an F-35 opponent. Meaghan Emery, another former councilor who has also fought the F-35, will meanwhile face Mike Simoneau, an ally of the “bloc of three,” in a race for a two-year seat. Harrington offered a preview on Tuesday of the confrontations that could ensue if she wins a council seat. In a public comment session, she accused Mackenize, Nowak and Shaw of violating the state's open meeting law. The three councilors had earlier recounted their attendance at a meeting last Saturday at which South Burlington's candidacy for a Georgetown University energy prize was discussed. The presence of the three constituted a “council quorum,” Harrington said, adding that the public should have been notified in advance of such a gathering. The councilors said they had not been aware of that requirement.